1) Messine – De gueules à deux côtes humaines d’or mouv des flancs opposées. English: Gules two human rib bones or coming from the flanks opposing. 2) Portugal, Espagne – Écartelé au 1 d’or à une montagne mouv de la pointe sommée de roseaux feuillés le tout au naturel au 2 de gueules à un canard nageant dans une eau au naturel au 3 de gueules à une tour sommée d’une tourelle d’argent ouverte et ajourée d’azur posée sur une colline de sinople et une pomme de grenade ouverte au naturel posée devant la porte de la tour au 4 d’azur à cinq étoiles (8) d’argent 2 1 et 2. English: Quarterly 1st or with a mountain coming from the base surmounted by reeds leaved all proper 2nd gules with a duck naiant [swimming] in a river proper 3rd gules with a tower surmounted by a turret argent doorways and openings azure placed over a hill vert and a pomegranate open proper placed in front of the door of the tower 4th azure with five etoiles of 8 points argent 2 1 and 2. 3) Espagne – (Arm. français) – D’azur à la croix de gueules chargée d’un lis de jardin fleuri de six pièces d’argent à la bordure du dernier chargée de huit croissants d’or. English: Azure a cross gules charged with a lily [flower] flowered of six pieces argent a bordure of the last charged with eight crescents or. 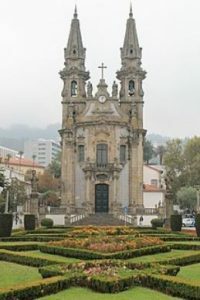 4) Acosta-Telles – Portugal, France – (Arm. gén. de 1696) Blaise , marchand portugais – D’azur au pal d’or accosté de deux lis au naturel. English: Azure a pale or having to the sides two lilies proper. 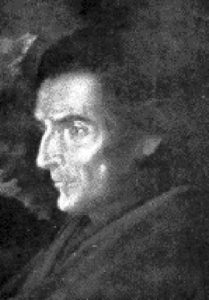 Joaquin de Acosta, nineteenth century Colombian historian. 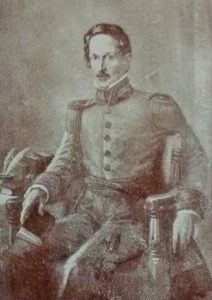 Jose de Acosta, S.J. (Spanish: 1540-1600) is called the Pliny of the New World because of his book Natural and Moral History of the Indies which provided the first detailed description of the geography and culture of Latin America, Aztec history and – of all things – the uses of coca. For his work on altitude sickness in the Andes he is listed as one of the pioneers of modern aeronautical medicine. Jose was far ahead of his time in the selection and description of his observations. Not satisfied, however, with mere descriptions, he tried to explain causes. Jose was one of the earliest geophysicists, having been among the first to observe, record and analyze earthquakes, volcanoes, tides, currents, magnetic declination’s and meteorological phenomena. He denied the commonly held opinion that earthquakes and volcanoes originated from the same cause, and had an interesting explanation of the origin of the world’s trade winds: he offered the earliest scientific explanation of the tropical trade winds. Jose traveled extensively through Peru, Bolivia, Chile and Mexico; he was the first European to systematize the geography of the New World. Gonzalo de Acosta who was a conquistador who voyaged with Diego Garcia de Moguer and Sebastian Cabot to the Rio de la Plata in 1527. Juan de Acosta to Florida in 1538. Magdalena de Acosta to Peru in 1592. Geronimo de Acosta and his wife Juana de Leon to Peru in 1593. Juan de Acosta who assisted Pizarro in the conquest of Peru. Fredrico Acosta settled in New Orleans, LA in 1826.